Last weekend, my best friend and I spent a day at the lovely Loews Don CeSar located on St. Pete Beach. After a fantastic lunch at Sea Porch and a relaxing afternoon at Spa Oceana, we headed to The Lobby Bar at Don CeSar, which is my favorite hotel bar on the planet. The mixologists are super talented, consistently changing the menu and use local fresh ingredients. 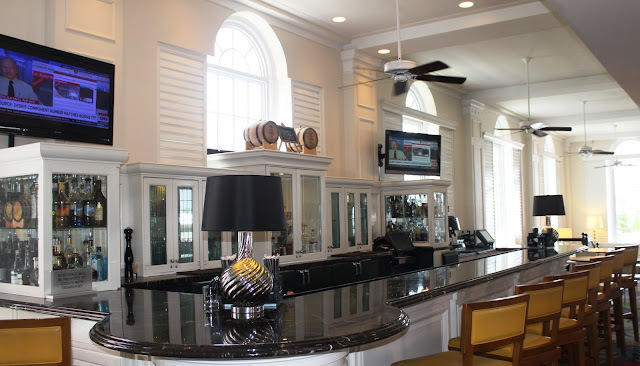 The Lobby Bar overlooks the Gulf of Mexico and is in the epicenter of the iconic Pink Palace. Along with amazing hand crafted cocktails, they also feature one of the best wine by the glass menu's I've seen (hello Silver Oak!). The icing on the cake (or cherry on top?) is the nightly live music...they've got a piano player who will blow your mind! Speaking of mind blowing, check out this cocktail - "The Old Smokey" a house smoked bourbon in a scotch box with a smoking gun. I was super excited to try out the brand new Summer Peaches and Pepper Margarita which was featured on the news that very morning! I was able to score the recipe which I posted below. This margarita was delicious. I will be making these this weekend! My Cosmo loving BFF ordered.....a Cosmo. You always know a good cosmo by it's color and this one was perfect. So perfect, she ordered two! Along with fantastic cocktails, Keri and I enjoyed a late day snack from the Prime Time Bar Bites menu at The Lobby Bar, Artisan Cheese Selection - Preserved Walnut, Baguette, Market Jam, Charcuterie. I enjoyed this along with a glass of Veuve Clicquot. Lastly, I have to call these grits out. I saw them on the menu as a side to the Braised Pork Belly. They are Truffle Grits - so of course I had to ask for a side. I literally went cross eyed. Next time I am at Loews Don CeSar, I will try this dish in it's entirety. The Lobby Bar is open to the Public and is the perfect place to spend Happy Hour and watch the sunset. They are open daily from 3pm-1am and even have an early bird and late night menu. Click here to check out their special offers, including the Summer Like a Local package!